The Glade fragrances I fell in love with last year came out in spray bottle formats and I'm wondering why I have more of the pink (my favorite scent) and green scents and none of the coconut ones... I don't remember if I hated it or if I ever talked/blogged about it and that kind of bothers me. I didn't review it, even if it was just for myself. So I decided to review more of things I use/love/hate this year to look back on later. 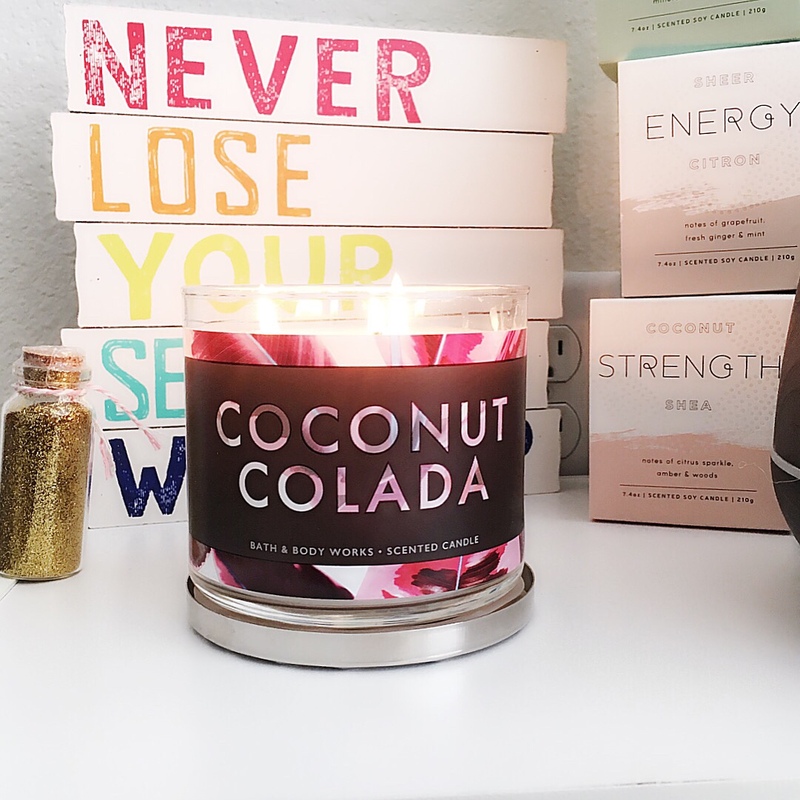 Coconut Colada is a new scent Bath & Body Works released just right after they launched their semi annual sale this year. It retails for $24.50 but we were lucky enough to get this for 50% off (I mean it was still pretty expensive, thanks B&BW). The scent notes include: Creamy Coconut, Spiced Banana & Rum. Wtf does Spiced Banana even smell like?! I honestly don't get a "Banana" scent from this candle, at all. I do get the Coconut and the Rum very heavily. In fact whenever this candle is lit I'm not sure if I want to eat another Coconut Bonbon candy or drink half a bottle of Parrot Bay. It's such a mixed feeling/scent. I don't really know why I felt like this was going to be a Pineapple Coconut scent, I guess because they threw the word "colada" in there. I don't hate the scent but sadly I don't love it either. It's not a scent I would incorporate with summer or the beach. Though I would probably incorporate it into drinking ON the beach or being in one of those drinking huts you see on beaches in the movies. Maybe even being at Kona Cafe Sushi Bar in the Poly Resort at Disney World. THAT'S WHAT IT SMELLS LIKE. Dole Whip soft serve drowned in Parrot Bay like they did that one year for Flower & Garden (or maybe still do, I don't know, after that first time I swore off spiked Dole Whip. Wasn't that great imo). Overall I LIKE it but not more than the Spiced Coconut Milk. Have you sniffed this scent or any scents from the new line? Is there one you like the most?